Heartland Boy attended an education seminar titled “Reading Property Signs in the Year of Dog” on 13 January 2018. It was organized by Vina Ip, the founder of Property Club Singapore. Tapping on her personal network, Vina managed to round up leading professionals in their respective fields to share their outlook for the Property market in 2018. Rather than bore you with perspectives already available in the market, Heartland Boy will only highlight golden nuggets of wisdom from the speakers that are generally not reported in the mainstream media. Essentially, this is a quick summary that separates the wheat from the chaff. Kah Poh shared an anecdote whereby Knight Frank was hired to market Paya Lebar Quarter. The average price of $1,800 psf achieved when the project was launched surprised even his team’s estimate of $1,400 psf. That moment confirmed his belief that the Singapore residential market had turned a corner. One of the more surprising conviction calls made by Kah Poh was the opportunity in short leasehold properties. He was quick to acknowledge that this is not available for the everyday-investor given the inability to access financing for such developments. Instead, retirees or recent en-bloc millionaires can consider such properties if the remaining leasehold provides a sufficient margin over their estimated longevity. In this way, this group of retirees can set aside a greater amount of cash as part of their retirement funds. Heartland Boy had previously published an article highlighting the dangers of young couples buying resale HDB flats with short leaseholds. Even then, this suggestion by Kah Poh may also not sit well with the pioneer generation. It is a direct challenge to cultural norms. It will take a huge mindset shift whereby not leaving physical real estate to the next generation is deemed as acceptable by societal standards. Nonetheless, it is indeed a good alternate solution to consider for this select group. Paul showed a very interesting set of data that reveal some form of correlation between high unemployment rate, high interest rate and global recession. While they certainly do not highlight a causal linkage between them, it gave Heartland Boy food for thought and the need to stay invested with greater caution for 2018. Based on the various home loan packages that Paul has seen on his website, he has a personal view that home mortgages on fixed rates are currently underpriced at the moment. His data showed that some 3-year fixed rate home mortgages are now priced at 1.8% – 1.85% and they are comparable to a floating home loan pegged to the Sibor (1-month). This underpricing is especially illuminating given that Fed is targeting 3 more rate hikes in 2018 that is likely to result in a 75-basis point increase in interest rates. Taking a long-term perspective, Vina does not believe that the residential market has turned around as reported in the mainstream media. Her stance was formed by comparing latest URA statistics such as resale volumes and prices, rental prices and vacancy rates against the respective peaks achieved in 2011. Vina demonstrated her ability to connect with the crowd when she translated these industrial jargon into a primary school student score card which was easily digested by the attendees. Property investors should behave like a female dog; be less reactive to external noise and stimulus, stay calm and focused on the long-term goal of “making money”. On the contrary, genuine home buyers should behave like a male dog and seriously think about renting rather than buying. Such analogies were greeted with approval from the audience! Besides sharing how REIT is a viable instrument to stay Invested In the property market, Kenny also shared that blue-chip REITS are fairly valued in today’ environment. During a Question & Answer segment, Kenny shared that he is looking at small-cap REITS that operate specifically in the office and hospitality segments. He believes that these 2 sectors are on a cusp of recovery and properties in these sectors will enjoy operational statistics. Oh yes, Kenny is a familiar face because he was one of the blogger-panelists featured alongside Heartland Boy at Invest Fair 2017. The seminar culminated in a roundtable discussion with various industrial experts at the end of the seminar. It was also during this roundtable discussion that Heartland Boy met an industrial expert in Wee Kwang, who founded Absolute Inspection. Given that his BTO is likely to TOP this year, Heartland Boy may just give Wee Kwang a ring during the defects inspection stage. The roundtable discussion created a more personal setting and allowed participants to direct their questions to the experts in a smaller setting. The honest and generous sharing by the industrial experts was akin to taking a close friend out for lunch. Therefore, Heartland Boy thought that this segment alone was worth the face value of the entry ticket. 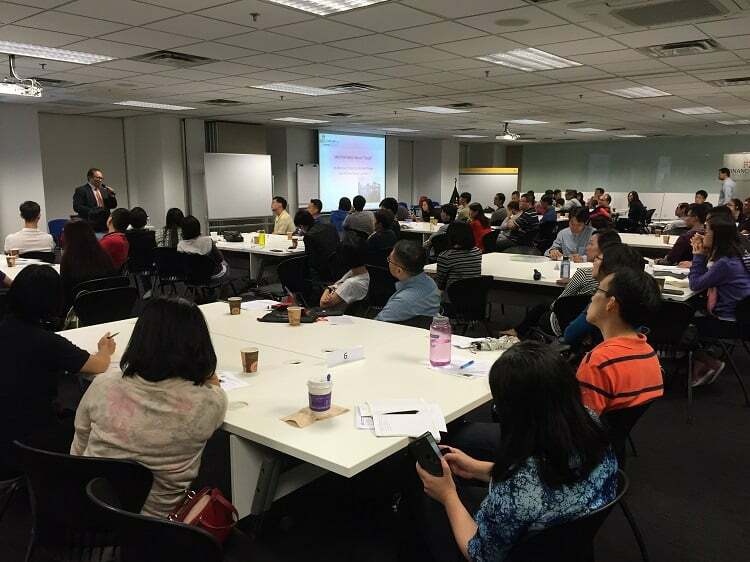 Having attended her workshop on buying good quality properties in the past, Heartland Boy thinks that Vina has once again delivered a value-for-money seminar.